It should come as no surprise that comedians would feel threatened by the attack on Charlie Hebdo: the freedom to offend is the source of their livelihood, and many who have offended have been threatened for doing so. That these murders were carried out over cartoons – a medium normally associated with laughter – makes the viciousness of the crime even more incomprehensible. Laughter is a distinctly human trait. No other species is known to enjoy a good laugh or produce laughter. Killing, on the other hand, is not distinctly human. Many animals kill other animals. Perhaps this is why it’s so unsettling when someone is killed over a joke. When humor – the one trait that separates us from all other species – provokes senseless carnage, we are reminded of how primal we are. But comedy – especially satire – has historically been used by the socially marginalized and powerless to deftly critique, deflate, and humanize those in power. Every royal court had its jester. Jonathan Swift made a modest proposal. Cartoonist Thomas Nast challenged the corruption of Tammany Hall. And nightly, many tune in to The Daily Show. Laughter, therefore, is most effective when it comes from below to mock and diminish the powerful. Yet when laughter comes from above (the powerful) – and is aimed at the powerless – it often comes across as mean-spirited bullying. In this respect, the description of Charlie Hebdo as a bunch of “white men punching down” is an accurate characterization of the periodical’s cartoons – along with the anti-Irish, anti-black, and anti-women editorial cartoons we’ve seen throughout history. Cartoonist Thomas Nast used satire to mock the powerful. 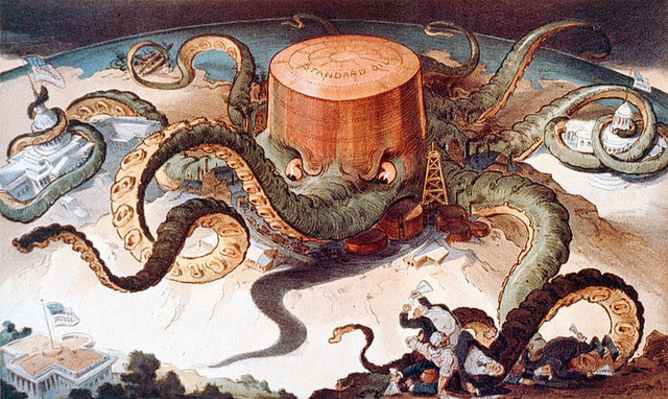 In this panel, he goes after oil conglomerate Standard Oil. This is not to say that the victims had it coming. But in the resultant battle of absolutes – the absolute freedom of speech (and freedom to offend) versus Islam’s absolute prohibition of caricaturing Mohammed – we have competing narratives about power and social position. Charlie Hebdo and its defenders are claiming that they are being oppressed by any whiff of censorship, of any request for restraint. Meanwhile, people of faith believe they are being attacked when they see their most cherished beliefs and figures lampooned and degraded in print. Those who speak of free speech in absolute terms see this as a draw: both sides are aggrieved, both sides ought to be allowed to have their say, but both sides are better off for living in a society that permits them to have this conversation. This attitude masks the very real power differentials that fuel violence when speech and language fail. Not all have equal access to free speech. In the case of Charlie Hebdo, a small newspaper leveraged the free speech and press laws of France to position itself as a marginalized outsider – even as they satirize groups that are actually marginalized and oppressed. Concurrently, religious extremists view themselves as marginalized, bullied and oppressed; otherwise they would have no justification for their radical behavior. And those who claim “Je suis Charlie” argue that they’re victims of an ideology that threatens rights of free speech, even as the French government, the Guardian Media Group, Google’s Press Innovation Fund and other French newspapers have promised to help Charlie Hebdo publish 1 million copies of its next edition (up from a normal print run of 50,000). Is free speech in France really in danger? Meanwhile, many cartoonists responded to the Charlie Hebdo massacre by drawing a distinction between the gun and the pencil – between violence and laughter. They’ve used this juxtaposition to illustrate how words exist apart from violence, and how laughter – even when it is solicited by mocking, by insults, or by racist stereotypes – is even further from violence, because laughter is a pleasure-based response. But laughter and violence have two things in common: first, they are both non-verbal; second, both occur when words fail. We receive odd advice as children: we are told that sticks and stones can break our bones but words can never hurt us. But words can hurt. Plenty. And when words fail to hurt, all that is left are sticks and stones – or in this case, bullets. Recently I was teasing my eight-year-old daughter, thinking I was being playful and celebrating what she had gotten wrong in an adorable way. She hit me in the leg and I reminded her that in our house “we use words, not hands.” She said she didn’t know what to say. Unable to carry on the conversation, she responded with a different language: violence. When laughter and violence are thought of as distinct and absolute entities, the mocked are left silent and humiliated, while the victims of violence become afraid to speak – or, in the case of the Paris shootings, are dead. To truly value free speech, it’s necessary to avoid delineating laughter and violence as opposite extremes. The definition of free speech needs to be broadened. It’s not merely speaking: it’s being responded to. If one is responded to, then at least he or she has been listened to.